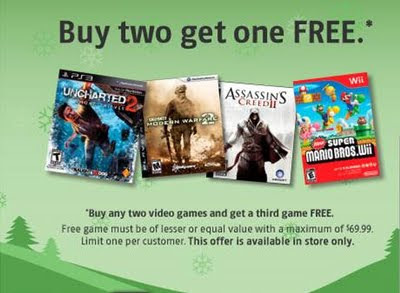 Best Buy Canada and Future Shop announced a 'buy 2, get 1 free' promotion on this past Friday for all video games for the following platforms: PS3, PS2, Xbox 360, Wii, DS, PSP, and PC. If you own multiple platforms you can mix and match by buying any combination of games, so you could say get Modern Warfare 2 for Xbox 360, Assassin's Creed II for PS3 and then get New Super Mario Bros. Wii for free. There are two restrictions to be aware of: the free game must be equal or lesser value with a maximum value of $69.99 and the deal is limited to one per customer. The in-store only promotion finishes on December 10, 2009. Looks like Toys R Us will have to take a backseat this year as this is the exact same promotion they ran last December. Something funky must have happened since Toys R Us down in the States had this promotion back in October. But hey, at least we got the deal here in Canada, even if it jumped retailers! Half-Minute Hero is a PSP game that will not be disliked by most that lay their hands on it. It is much of an RPG game although it does go away from many rules that most of the others follow. This game, for one, does not spend the gamer's time in going through cutscenes hat might take up almost half of the actual gaming time. This game is all about fats paced action and cut throat speed that does not give you enough time to doze off. It is surely one of the best in its class. On the PSP, this 8 bit game is well made to remind you of the bygone days when 8 bit games were popular. The game, nonetheless, looks beautiful in spite of the seemingly low resolutions. Here, you go about trying stop the evil hordes that are collecting again the inhabitants of the world. They had been defeated before by benevolent forces, however, they plan on their revenge again. With the wide array of heroes, this game gets quite exciting when you find the sarcastic remarks that they keep on throwing at you. Every line reeks of humor and sarcasm that only RPG gamers might be able to fully understand. Nonetheless, this game, apart from a few minor slumps, delivers what most gamers might have wanted. You have no time to waste, or muse about the unnecessary elements that so many other game throw at you. Simply enjoy such PSP video games. I picked up Assassin's Creed II, Uncharted II, both for PS3, and Mario Kart for Wii. Mix and match was definitely in full effect. Very nice. I've been doing some mixing and matching myself. Picked up two DS RPGs (Kingdom Hearts + Mario & Luigi) and finally nabbed Street Fighter IV for PS3.